Matt is a college student who enjoys buying and selling merchandise using the Internet. On January 2, 2018, he decides to turn his hobby into a business called "Good Deal Co." Each month the Good Deal Co. will have one or two transactions. At the end of each month we will prepare an income statement, balance sheet, and a statement of cash flows for the current month and for the year-to-date period. The purpose is to show how these transactions are reported on the cash flow statement. 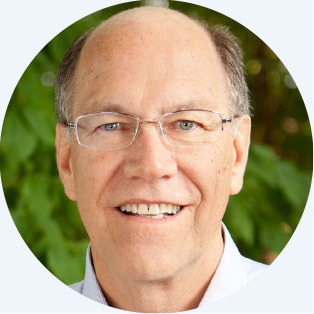 On January 2, 2018 Matt invests $2,000 of his personal money into his sole proprietorship, Good Deal Co. On January 20, Good Deal buys 14 graphing calculators for $50 per calculator—this is about 50% less than the selling price Matt has observed at the retail stores. The total cost to Good Deal for all 14 calculators is $700. Good Deal has no other transactions during January. Good Deal's income statement for January showed no profit or loss, since it did not have any sales or expenses. 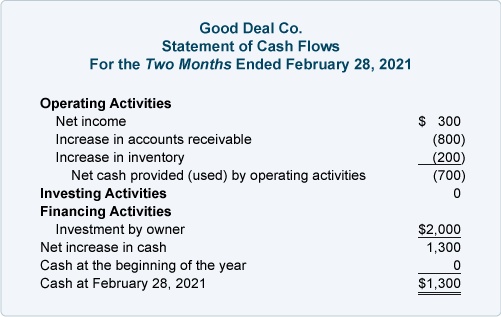 However, the cash flow statement reports that Good Deal's operating activities resulted in a decrease in cash of $700. The decrease in cash occurred because the company increased its inventory by $700 during January. The financing activities section shows an increase in cash of $2,000 which corresponds to the increase in Matt Jones, Capital (Matt's investment in the business). The net change in the Cash account from the owner's investment and the cash outflow for inventory is a positive $1,300. This net change of a positive $1,300 is verified at the bottom of the cash flow statement and on the balance sheet. There was a $0 cash at January 1, but at January 31, the Cash balance is $1,300. For a change in assets (other than cash)—the change in the Cash account is in the opposite direction. Recall that when Inventory increased by $700, Cash decreased by $700. For a change in liabilities and owner's equity—the change in the Cash account is in the same direction. Recall that when the owner invested cash in the company Cash increased and Owner's Equity increased. On February 25, 2018, Good Deal sells 10 calculators to a nearby high school for $80 each. Matt delivers the calculators on February 25 and gives the school an $800 invoice due by March 10. Matt receives $800 from the school on March 8. The income statement for the month of February shows revenues (or sales) of $800. 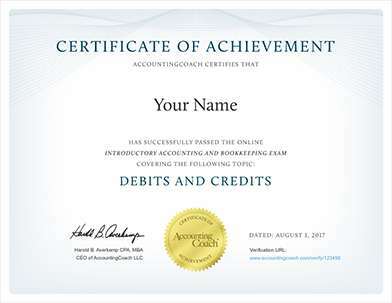 Under the accrual basis of accounting—revenue is recognized when title passes (at the time of shipment or time of delivery), not when the money is received. Expenses (such as the cost of goods sold for $500) appear on the income statement when they best match up with revenues, not when the expenses or goods are paid for. (Other expenses will also appear on the income statement when they are used, not when they are paid for.) As a result of the accrual basis of accounting, the income statement reports $300 of net income even though there was no cash inflow or cash outflow during February. As you can see above, the cash flow statement for the month of February reports no change in cash. That agrees with the company's balance sheet that reported Cash of $1,300 on January 31 and will show $1,300 on February 28. The year-to-date net income of $300 increases the owner's equity on the balance sheet. Please note the connection between the bottom line of the year-to-date income statement and the change in Matt Jones, Capital on the balance sheet. Matt Jones, Capital has increased from $2,000 to $2,300. 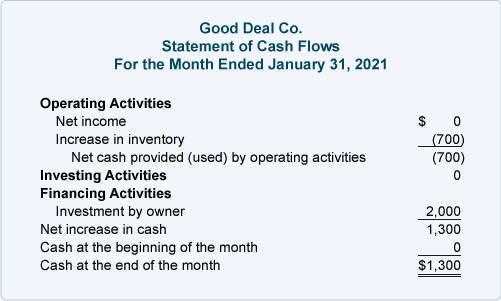 Good Deal's income statement for the first two months shows a positive net income of $300. However, the fact that the company's Accounts Receivable increased by $800 means the company did not collect the cash from its sales. And because Inventory increased by $200, the company's Cash had also decreased in order to pay for the Inventory increase. 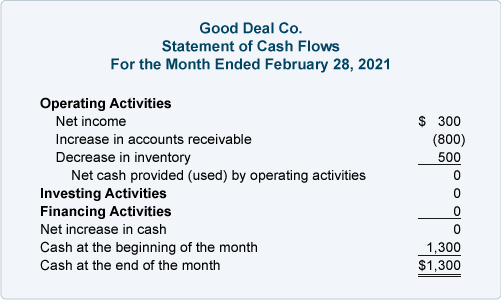 As a result, the cash flows for the two-month period shows that Good Deal's cash from operating activities is a negative $700. Recall that Good Deal has not received any money yet from its operations (buying and selling merchandise) and it paid out $700 for the 14 calculators it purchased. The cash flow statement also shows $2,000 of financing by the owner. When this is combined with the negative $700 from operating activities, the net change in cash for the first two months is a positive $1,300. This agrees to the change in cash on the balance sheet—none on January 1 but $1,300 on February 28.